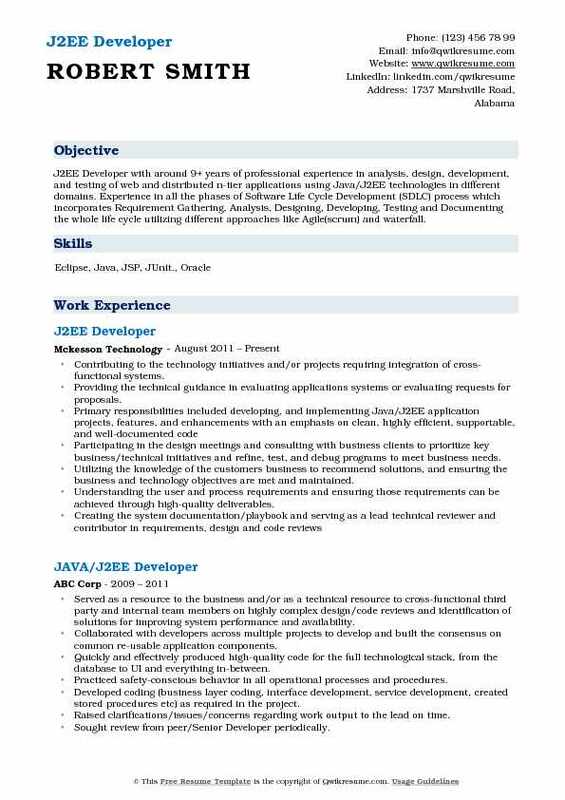 J2EE Developer’s roles and responsibilities are to manage Java and J2EE application development. The other specific job tasks for these developers are to provide expertise in full software development right from concepts, designs to testing; designing and developing low latency high-volume applications, contributing in all phases of development, writing an efficient, well designed and testable code; ensuring that the designs comply with the policies and specifications, preparing and producing releases of various software components, supporting continuous improvement through research, investigating alternatives and presenting them for architectural view. 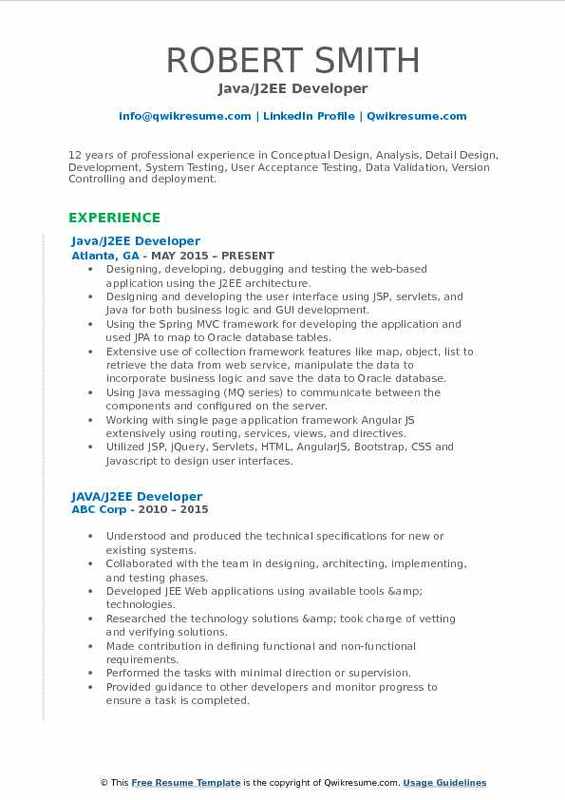 The essential requisition that needs to be added to the J2Ee Developer Resume is proficiency in Java development, an insight of Java and JEE internals, excellent relational database, ORM and SQL knowledge, experience in spring framework and other popular web networks. 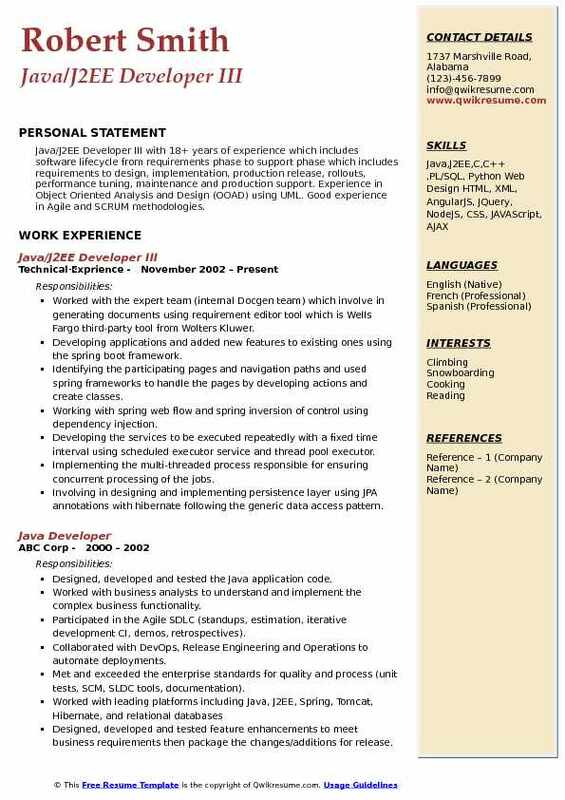 Eligible resumes normally make a display of a Degree in the field of Computer Science, Engineering or the related. Preparing analysis document and followed agile software development with scrum methodology. Applying data transformation rules to transform code from one format to another format using NodeJS. Creating the NodeJS express server to build MVC framework from front-end side AngularJS to the back-end. Developing the front-end code with Ajax call in AngularJS and jQuery to retrieve data as json object from controllers in back-end restful server. Extensive experience using framework APIs like Struts, Spring, Ibatis, and Hibernate. Working on the spring framework like Spring IOC, Spring DAO, Spring ORM and Spring Integration. Involving in the development of backend logics or data access logic using Oracle DB & JDBC. 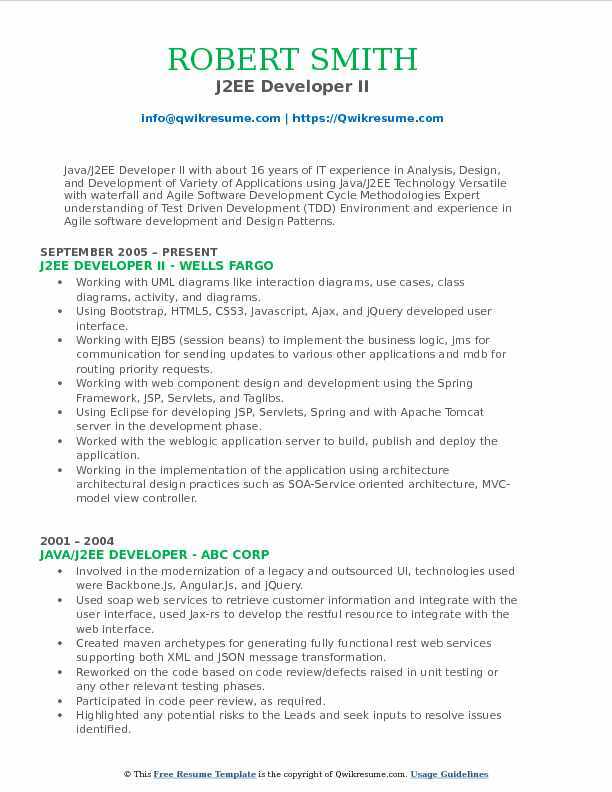 Summary : Sr. Java/J2EE Developer with over10 years of professional IT experience with full project lifecycle development in Java/J2EE technologies with Requirement Analysis, Design, Implementation, Development, Testing, Maintenance, and Deployment of software applications. Highly experience with Java complaint IDEs like Eclipse, IntelliJ, WSAD, RAD 6, and Builder. Knowledge of Eclipse tool for the development of Java projects. Hands on experience Struts and Spring. Developed various java beans for the performance of business processes and effectively involved in impact analysis. Creating restful web services interface to Java-based runtime engine and accounts. Configuring servlets, java classes, spring framework, hibernate, database drivers, data sources related to project. Working on the integration of spring and hibernate frameworks using spring orm module. Working on Atlassian products like Jira, Bamboo, Bitbucket, and Confluence for issue tracking, release management, code review and documentation. Integrated subsystems using SOAP-based web services and Apache Axis2. Designed and developed a restful hub application which resolved the single-sign-on authentication of the target secured rest services. 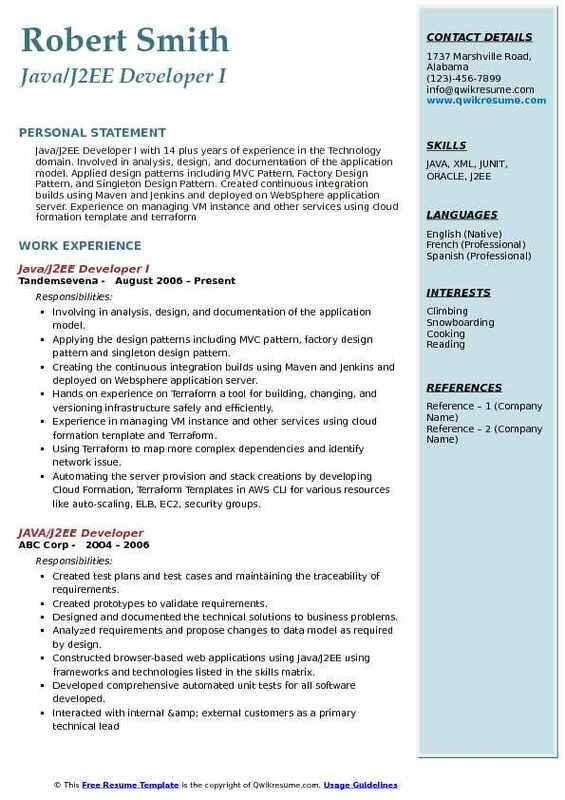 Objective : J2EE Developer with 4+ years of experience in the Information Technology Industry and also healthy participation in all phases of Software Development Life Cycle (SDLC) including analysis, design, coding Experience in Web Application Development, Client-Server based Enterprise Applications, System Analysis, Technical Design, B2B Implementation, Performance Tuning and Testing. Involving in the creation of low-level design including sequence diagrams and class diagrams to comprehend the existing architecture. Evaluating the suitability of Hadoop and its ecosystem to the above project and implemented various proof of concept (POC) applications to eventually adopt them to benefit from the big data Hadoop initiative. 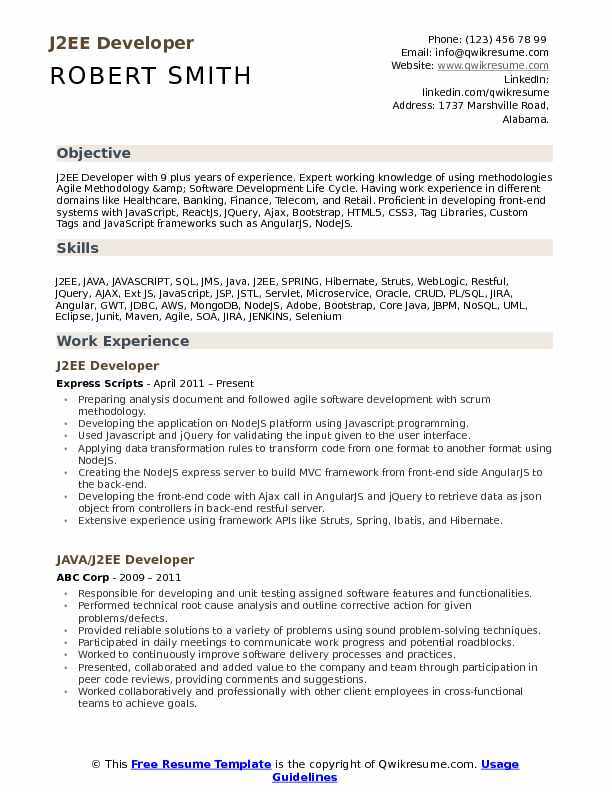 Worked in a team that built big data analytic solutions using Cloudera Hadoop distribution. Imported data from RDBMS (MySQL, Teradata) to HDFS and vice versa using Sqoop (big data ETL tool) for business intelligence, visualization and report generation. Involved in various POCs to choose right big data tools for business use cases. Expertise in big data technologies like Apache Spark, H20, Elastic Search, Cassandra, Yarn, Hive, Storm, and Kibana. Working on apache spark "in memory computational framework", Hbase/Mapp-m7, hive, core java to create matching/linkage batch jobs in the big data environment. Involving in the integration of spring for implementing dependency injection. Developing code for obtaining bean references in Spring IOC framework. Focusing primarily on the MVC components such as dispatcher servlets, controllers, model and view objects, view resolver. Summary : 12 years of professional experience in Conceptual Design, Analysis, Detail Design, Development, System Testing, User Acceptance Testing, Data Validation, Version Controlling and deployment. Designing, developing, debugging and testing the web-based application using the J2EE architecture. Designing and developing the user interface using JSP, servlets, and Java for both business logic and GUI development. Using the Spring MVC framework for developing the application and used JPA to map to Oracle database tables. Extensive use of collection framework features like map, object, list to retrieve the data from web service, manipulate the data to incorporate business logic and save the data to Oracle database. Using Java messaging (MQ series) to communicate between the components and configured on the server. Working with single page application framework Angular JS extensively using routing, services, views, and directives. Involved in writing SQL, PL/SQL queries and stored procedures for the application in Oracle. Involving in analysis, design, and documentation of the application model. Applying the design patterns including MVC pattern, factory design pattern and singleton design pattern. Creating the continuous integration builds using Maven and Jenkins and deployed on Websphere application server. Hands on experience on Terraform a tool for building, changing, and versioning infrastructure safely and efficiently. Experience in managing VM instance and other services using cloud formation template and Terraform. Using Terraform to map more complex dependencies and identify network issue. Automating the server provision and stack creations by developing Cloud Formation, Terraform Templates in AWS CLI for various resources like auto-scaling, ELB, EC2, security groups. Experience in setting up CICD pipeline integrating various tools with cloud bees Jenkins to build and run terraform jobs to create infrastructure in AWS. Developing the reusable Terraform service modules to provisioning infrastructure for multiple applications. 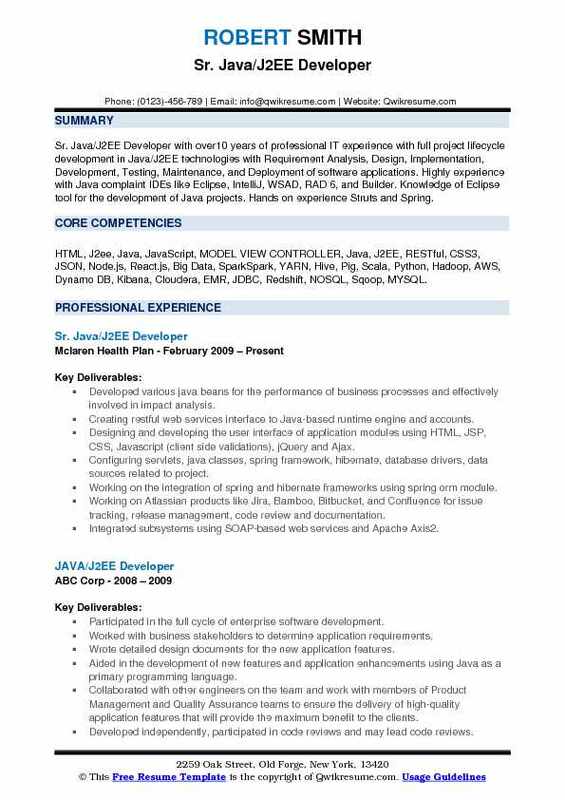 Summary : J2EE Developer with around 9+ years of professional experience in analysis, design, development, and testing of web and distributed n-tier applications using Java/J2EE technologies in different domains. Experience in all the phases of Software Life Cycle Development (SDLC) process which incorporates Requirement Gathering, Analysis, Designing, Developing, Testing and Documenting the whole life cycle utilizing different approaches like Agile(scrum) and waterfall. Contributing to the technology initiatives and/or projects requiring integration of cross-functional systems. Providing the technical guidance in evaluating applications systems or evaluating requests for proposals. Participating in the design meetings and consulting with business clients to prioritize key business/technical initiatives and refine, test, and debug programs to meet business needs. Utilizing the knowledge of the customer's business to recommend solutions, and ensuring the business and technology objectives are met and maintained. Understanding the user and process requirements and ensuring those requirements can be achieved through high-quality deliverables. 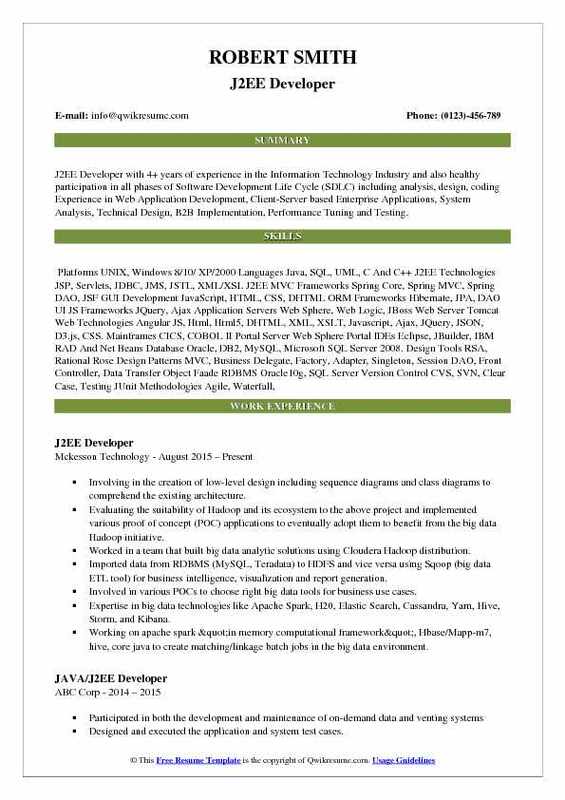 Summary : Java/J2EE Developer II with about 16 years of IT experience in Analysis, Design, and Development of Variety of Applications using Java/J2EE Technology Versatile with waterfall and Agile Software Development Cycle Methodologies Expert understanding of Test Driven Development (TDD) Environment and experience in Agile software development and Design Patterns. Working with UML diagrams like interaction diagrams, use cases, class diagrams, activity, and diagrams. Working with EJBS (session beans) to implement the business logic, jms for communication for sending updates to various other applications and mdb for routing priority requests. Working with web component design and development using the Spring Framework, JSP, Servlets, and Taglibs. Using Eclipse for developing JSP, Servlets, Spring and with Apache Tomcat server in the development phase. Worked with the weblogic application server to build, publish and deploy the application. Working in the implementation of the application using architecture architectural design practices such as SOA-Service oriented architecture, MVC-model view controller. Implementing the business logic using Java as Pojos for various modules of the system. 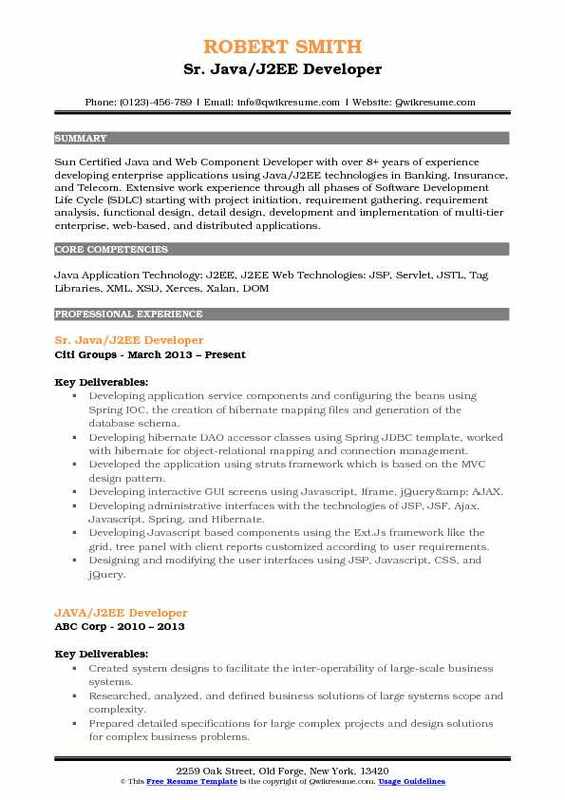 Summary : Sun Certified Java and Web Component Developer with over 8+ years of experience developing enterprise applications using Java/J2EE technologies in Banking, Insurance, and Telecom. Extensive work experience through all phases of Software Development Life Cycle (SDLC) starting with project initiation, requirement gathering, requirement analysis, functional design, detail design, development and implementation of multi-tier enterprise, web-based, and distributed applications. Developing application service components and configuring the beans using Spring IOC, the creation of hibernate mapping files and generation of the database schema. Developing hibernate DAO accessor classes using Spring JDBC template, worked with hibernate for object-relational mapping and connection management. Creating the distributed Oracle coherence domains, configuration and system design based on oracle coherence. Working on persistence layer using o/r mapping tool ibatis with Oracle database. Summary : Java/J2EE Developer III with 18+ years of experience which includes software lifecycle from requirements phase to support phase which includes requirements to design, implementation, production release, rollouts, performance tuning, maintenance and production support. Experience in Object Oriented Analysis and Design (OOAD) using UML. Good experience in Agile and SCRUM methodologies. Worked with the expert team (internal Docgen team) which involve in generating documents using requirement editor tool which is Wells Fargo third-party tool from Wolters Kluwer. Developing applications and added new features to existing ones using the spring boot framework. Identifying the participating pages and navigation paths and used spring frameworks to handle the pages by developing actions and create classes. Working with spring web flow and spring inversion of control using dependency injection. Developing the services to be executed repeatedly with a fixed time interval using scheduled executor service and thread pool executor. Implementing the multi-threaded process responsible for ensuring concurrent processing of the jobs. Involving in designing and implementing persistence layer using JPA annotations with hibernate following the generic data access pattern. Using Spring AOP and Dependency Injection (IOC) in developing discount generation services. Configuring and accessing Hibernate with Spring IOC. Used Hibernate with Spring in writing annotations to map relationships and create model classes. Used spring batch for reading, validating and writing the daily batch files into the database. 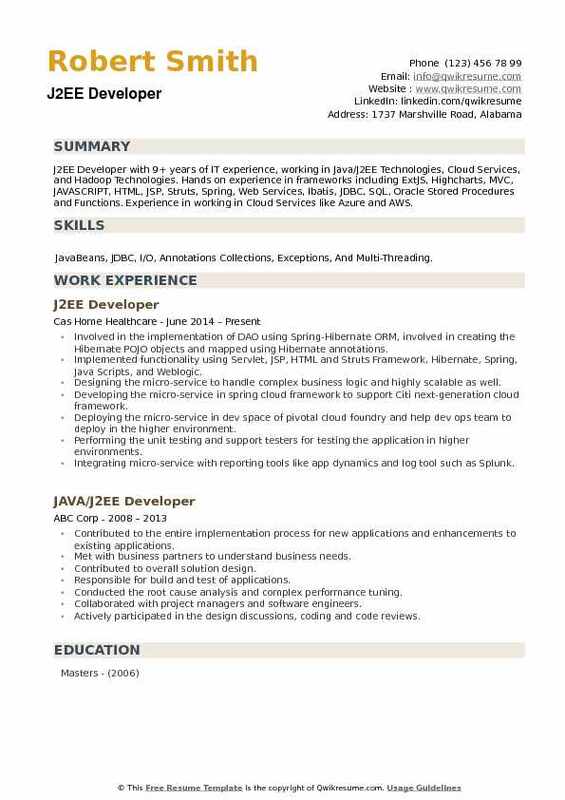 Skills : JavaBeans, JDBC, I/O, Annotations Collections, Exceptions, And Multi-Threading. Involved in the implementation of DAO using Spring-Hibernate ORM, involved in creating the Hibernate POJO objects and mapped using Hibernate annotations. Implemented functionality using Servlet, JSP, HTML and Struts Framework, Hibernate, Spring, Java Scripts, and Weblogic. Designing the micro-service to handle complex business logic and highly scalable as well. Developing the micro-service in spring cloud framework to support Citi next-generation cloud framework. Deploying the micro-service in dev space of pivotal cloud foundry and help dev ops team to deploy in the higher environment. Performing the unit testing and support testers for testing the application in higher environments. Integrating micro-service with reporting tools like app dynamics and log tool such as Splunk.